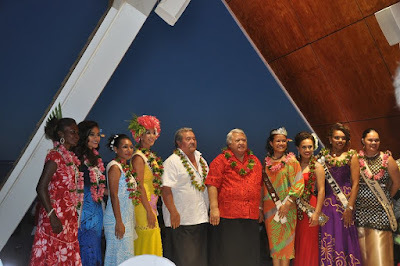 The Miss Pacific Islands Pageant contestants were treated to a cocktail dinner and entertainment, hosted by the Chairman of the regional pageant and Prime Minister of Samoa, Tuilaepa Lupesoliai Aiono Sailele Malielegaoi last night at the Taumeasina Island Resort. Gifts of a tanoa wooden bowl and ebony walking stick were presented to Prime Minister Malielegaoi by Chairperson of Miss Pacific Islands PNG, Katherine Johnston who pledged support to the pageant which is celebrating 30 years this year. Topic presentation which is the first judging category took place this morning at Tanoa Tusitala Hotel. Miss Limbiye presented a paper on Health, focusing on the health benefits of Coconut, or Niu as is known among the island people. Outfits worn by Miss Papua New Guinea, Kellyanne Limbiye and Miss Pacific Islands, Abigail Havora were made by WANTOK Clothing of Port Moresby. Crowning of Miss Pacific Islands will be held tomorrow evening. Those who want to watch live streaming can go to - tv1@samoa.tv1 .The show will begin at 7pm. Samoa is fours ahead."